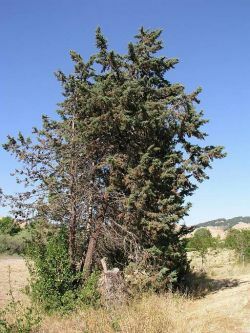 Comments: Evergreen conifer native to San Diego County, California. Blue-green scalelike leaves, 1 inch cones and dark-red smooth bark. The tree looks much like a Monterey Cypress, but the bark is much different. Height to 35 foot in its native habitat. This species is endangered in its native habitat.